PFA is abbreviation of Pink Fused Alumina(Pink Fused Aluminum Oxide, Pink Corundum, Pink Korund, Abrasives Pink Aluminum Oxide, Ruby Fused Alumina) contains Chromium Oxide which is the reason why it looks pink. It features less friability, sharp edges. 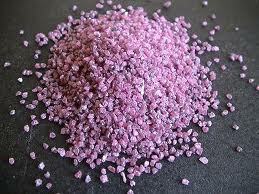 Pink Fused Alumina is suitable for sharpening tools, grinding wheels, surface preparation and abrasives tools. Hardness of Pink Fused Alumina is close to White Fused Alumina, but tougher. Abrasives tools made with PFA is with extremelly durability.